The Allgäubahn links München and Lindau via Kempten and is almost unique these days in being a busy, scenic, double-track, non-electrified main line with a good number of locomotive hauled trains. I had visited the line before in July 2006 and August 2007 but there were a number of reasons to go back in August 2008. ÖBB’s parallel Arlbergbahn was closed for major engineering work between 9 and 25 August 2008 and a number of overnight trains were routed via München, Kempten and Lindau. Daytime travellers weren’t so lucky and had to endure a bus connection between Landeck and Bludenz. 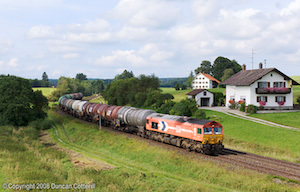 More interestingly for photographers, a number of freights were also diverted and ran over the Allgäubahn in daylight. 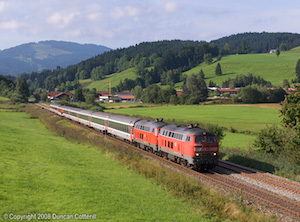 The regional passenger service also underwent a revamp at the December 2007 timetable change with ALEX taking over München – Lindau services from DB. The changes have brought about some welcome new photographic opportunities and closed off others. This report describes a trip to the line with Chris Wilkinson from Wednesday 20 to Sunday 24 August 2008. Full details of the locos and trains we saw can be found on the Sightings page. We flew to Zürich with BA then hired a car to get around. Our base for the trip was the Gasthof Drei König in the centre of Immenstadt. 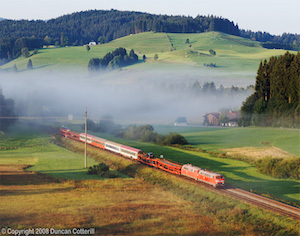 The December 2007 timetable change resulted in a big upheaval of passenger services in the Allgäu region. The new service pattern involves most trains from Ulm, Augsburg and München splitting at Immenstadt with one portion serving the branch to Oberstdorf and the other continuing along the Lindau line. DB Regio holds the contract for services from Ulm and Augsburg while the München services are operated by ALEX. 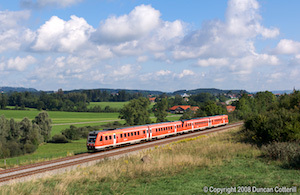 The requirement to split and combine trains has resulted in the virtual elimination of the traditional DB Regio class 218 worked push-pull sets from the line west of Immenstadt. There are still a few class 218 workings to Oberstdorf, particularly at weekends (see below). Some of the 218s displaced from the Allgäubahn are now employed on Augsburg – Lindau services routed via Memmingen. The vast majority of trains from Ulm and Augsburg are now operated by class 612 2-car DMUs running in pairs north of Immenstadt. Busier services can be formed of 3 2-car sets. The ALEX trains are hauled by class 223 diesels (Siemens ER-20, ÖBB 2016), usually on rakes of five or six coaches. 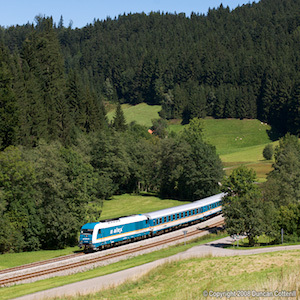 These split at Immenstadt with two or three coaches going forward to Lindau and the remainder being taken to Oberstdorf by a second class 223. ALEX has no driving trailers so all trains are hauled. 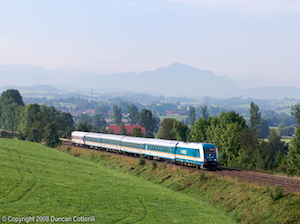 The current ALEX franchise covers trains from München to Regensburg and Hof as well as the Allgäu services and the locos and most coaches now carry an attractive blue livery. The situation hasn’t really changed since last year. 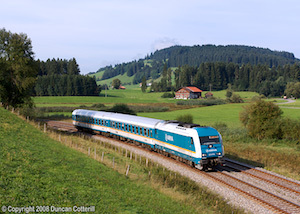 An early morning München – Zürich EuroCity and an evening return continue to run via Kempten while the remaining services take the faster but less scenic route via Memmingen. 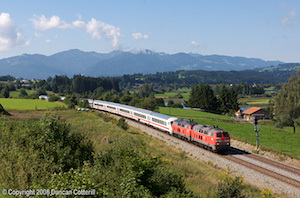 These trains are all booked for pairs of 218s between München and Lindau but single headers are not uncommon. 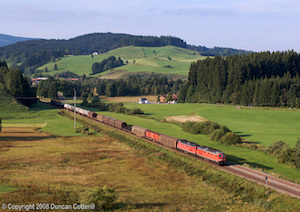 Two IC services originate at Oberstdorf every morning and are diesel hauled to Augsburg and Stuttgart (via Ulm) respectively. The Augsburg train is booked for a single 218 which runs round at Immenstadt. The Stuttgart train also leaves Oberstdorf behind a single 218 but from Immenstadt it is double headed for the remainder of the journey. The procedure is reversed for the return workings in the afternoon. The Allgäubahn sees very little regular freight these days. 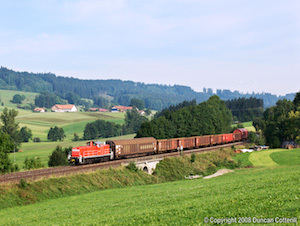 A class 294 hauled pick-up goods runs from Buchloe to Kempten on weekday mornings and returns around midday. 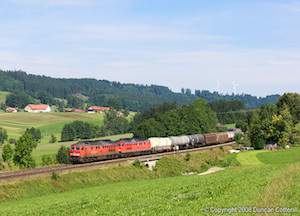 There are also irregular oil trains from the Buchloe direction to a distribution depot in Kempten. We were lucky to catch one of these returning north behind an HGK class 266 on Thursday morning. 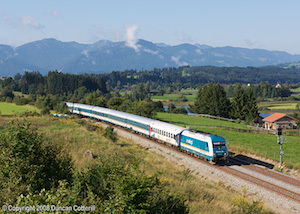 Four pairs of overnight passenger trains were diverted via Kempten with double-headed class 218 haulage between München and Lindau. The last westbound train was just about phottable west of Immenstadt but the remaining services ran in darkness. These trains weren't booked to make any public stops in Germany. The freight diversions were better timed with three westbound and two eastbound workings in daylight, all booked for pairs of class 232s between München and Lindau. The freights ran fairly close to the expected times but the morning eastbound ran as light engines on the Thursday and Friday and the afternoon westbound didn’t run at all on Wednesday. The diverted freights ran Monday to Saturday only with nothing on the Sunday. There were also a number of freights booked to be diverted via Memmingen with pairs of class 225s but we didn't see any of them. The Allgäubahn has more than its fair share of good photographic locations but almost all of them are remote from the remaining passenger stations. Buses are few and far between and a car is essential to get to the photspots. The weather was mixed during our visit. Wednesday afternoon was overcast and Thursday dawned misty but soon cleared. By the early afternoon it had clouded over again. Thursday's pattern was repeated on Friday but Saturday was overcast all day, culminating in a heavy downpour in the evening. Sunday morning was clear with excellent visibility but the sky was clouding over by the time we left for the airport in the middle of the afternoon. The weather allowed us to cover the prime morning locations, north of Oberstaufen, north of Martinzell and at Ellensberg and Görwangs, west and east of Günzach respectively. Each afternoon we tried to get the classic shots on the curves west of Harbatshofen, between Oberstaufen and Röthenbach, but the weather defeated us every time. Timekeeping was generally good and even the diverted trains usually turned up close to their booked times. Traction was also as expected with almost every train appearing with the booked power. EC196 was the main exception to these generalisations, turning up with a single 218 on Friday, 40 minutes late on Saturday and not at all on Sunday. There was obviously something amiss on the Sunday morning with trains from the west running up to 40 minutes late and reports on the KBS960 forum of very late westbounds at Röthenbach. The EC was almost certainly diverted via Memmingen on this occasion to avoid the disruption. The lack of 218 worked push-pull sets was very noticeable with only a handful seen north of Immenstadt and none successfully photographed. In part, the revamped ALEX trains made up for this. They do look very smart in the new blue and white colours and the fact that all trains are hauled opens up new photographic opportunities west of Immenstadt. Unfortunately, many of the locations are ideally suited to long trains and a loco and two coaches just looks lost. The tables on the Sightings page show all the trains in the Oberstdorf and Immenstadt areas that were booked for loco haulage during our visit to the Allgäu together with the numbers of the locos we saw working. The information required was obtained from the DB website (PDF Timetables), the V160 website (218 diagrams), the KBS960 and KBS970 websites (info on diverted trains). In spite of the indifferent weather, it was well worth making the effort to cover the Arlberg diversions. The 232 hauled freights and new-look ALEX passengers added plenty of variety to the shots taken on previous trips. The 223s may not appeal to everybody but they are a huge improvement on the DMUs that are displacing classic diesel locos elsewhere in Europe. Hopefully they will do well and we'll get some longer trains to photograph in the future. I don't think this will be my last visit to the area as there are a number of locations that I'm aware of but haven't managed to photograph yet and there are few diesel worked lines that are as photogenic as the Allgäubahn. With the parallel Lindau - Memmingen - Buchloe route slated for electrification, there may also be opportunities to photograph diverted EC trains in coming years.